Eau De Vie is quite frankly a place that can easily be mistaken for something other than a cocktail bar. With no sign to provide any hints or indications as to what it hides, it is subtly concealed behind large wooden doors at the end of Malthouse Lane. To the many that have been lucky to come across it, a door is all they see. But if you delve inside, its dimly lit, jazz infused vibe will immerse you into every bon vivant’s dream. Producing a relaxed and calming atmosphere upon entry, Eau De Vie takes it back to where it all began in the 1920’s – an intimate ambiance combined with unique drinking experiences and great jazz tunes, along with quality bartenders who know what you want even before you do. Similar to its sister bar in Sydney, the leather chairs and polished wood furnishings make it the epitome of sophisticated class. There is even a whisky room specifically closed off for your pleasure if ever you decide to hold any private functions or wish to consume your drink in peace and splendour. Eau De Vie isn’t kidding when it boasts to ‘transport you back to a much forgotten era where great service, cocktails, tommy guns and good times were king’. With three different menus, providing an unforgettable drinking experience is considered serious game for these guys. In fact, their drinks are chronologically ordered in the sense that the first drink is a recipe dating back from the 1900’s, with each concoction moving forward with the times until it reaches around the 1940’s. 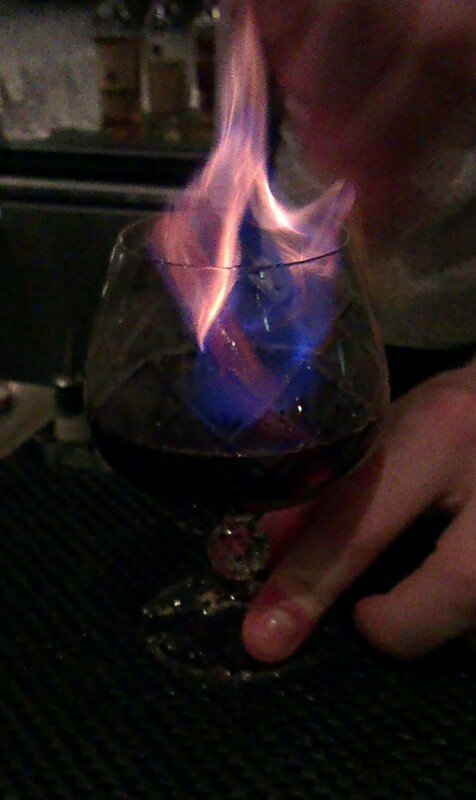 The first aspect that intrigued me about the drink was the flame. Eventually the flame would subside into the drink, producing a smoky, strong cinnamon smell. Because of the ember, consuming it felt like fire down my throat. Despite that, I was taken aback by the warm feeling it gave in my chest – its smooth texture enriched with sweet flavour that only the distinctive combination of rum and cinnamon could provide. This particular cocktail is highly recommended for those cold winter months, when the only thing on your mind is something to warm you up. Departing the bar all warm and bubbly made me realise that Eau De Vie is at the forefront for impeccable style and making flawless drinks, and it’s quite evident from this review that my first experience there was indeed a positive one. It’s really any wonder why they won best cocktail list of the year at the 2013 Australian Bartender Magazine Bar Awards. If you’re still on the hunt for that perfect bar you wish to call your second home, the look further than Eau De Vie.